Land Shark!! : Yes We Can!!!! Photo courtesy of The Pensblog. I think this may be a good time to remind ourselves that we have been here before in the 2009 Stanley Cup Playoffs. Think back to the Washington Capitals. How long ago that seems... The Pens came into DC after pretty well handling the Flyers and promptly dropped the first 2 games. However, they were not blown out in either of those games. They still brought their game and competed. The same thing can be said for the rematch against Detroit. The Pens have not been playing great, but the 2 games this past weekend were competitive. 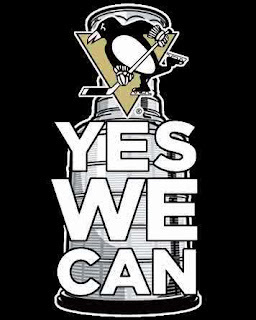 There is no reason to think that the Pens can't turn it on and stun Detroit. History may not be on our side, but that doesn't mean it is impossible!! I don't want to come off as whining here, but I do want to comment on a few things that I have noticed about the officiating from these 2 games. I know that the NHL wants these Finals to be exciting for the casual viewer to try to gain new fans, and I have no problem with that. But I think that the officiating needs to be consistent!! Each Ref is going to call a game differently, but so far, I think that the SCF Refs have decided that they are not going to be consistent with the way the Refs handled the earlier rounds. The fact that this is the Finals should not mean that the rules from the regular season and earlier rounds are not upheld. I think that this effects the Pens more than it does the Wings. As the Pensblog noted, the Refs lack of using their whistles takes away the fast type of game that the Pens play. They are catering more towards Detroit's clog up, interference style. I don't mind letting the players decide the game, that's the way that it should be, but when the rules aren't consistently applied, it detracts from the game. You're right, their previous series does seem so long ago. Because it was. Welcome to June, or as it is also known, "Month 4 of Hockey/Basketball Playoffs."